Published on the web 12 June 2018. The impact of a hands-on foods course on undergraduate students’ food skills was examined at the University of Guelph. For a convenience sample, first- and second-year students (n?=?47, 87% female) registered in the “Understanding Foods” course were recruited to participate in a survey administered on Qualtrics at the beginning of the semester and again at the end of the semester. Participants were asked questions related to demographics and food habits; additional questions on food skills, in Likert-scale format, included confidence in food preparation, food safety knowledge, and grocery shopping habits. Subscales were combined for an overall Food Skills Questions (FSQ) score and differences were determined by paired t tests. Overall, significant (P?<?0.05) improvements were observed related to students’ confidence and food safety knowledge scores as well as the overall FSQ score. Students, however, rated their personal eating habits more poorly (P?<?0.05) at the end of the semester. As a lack of food skills is often considered a barrier for healthy eating among students, these results signify the importance of a hands-on introductory cooking course at the undergraduate level. Conflict of interest: The authors declare that they have no competing interest. Cluskey M, Grobe D. 2009 May. College weight gain and behavior transitions: male and female differences. J Am Diet Assoc. 109: 325-9 Crossref, Medline,?Google Scholar. Papadaki A, Hondros G, Scott JA, Kapsokefalou M. 2007 Jan. Eating habits of university students living at, or away from home in Greece. Appetite. 49(1): 169-76 Crossref, Medline,?Google Scholar. Edmonds MJ, Ferreira KJ, Nikiforuk EA, Finnie AK, Leavey SH, Duncan AM, et al. 2008. Body weight and percent body fat increase during the transition from high school to university in females. J Am Diet Assoc. 108(6): 1033-7 Crossref, Medline,?Google Scholar. Vadeboncoeur C, Foster C, Townsend N. 2016 Nov. Freshman 15 in England: a longitudinal evaluation of first year university student’s weight change. BMC Obes. 3(1): 45 Crossref, Medline,?Google Scholar. Kremmyda LS, Papadaki A, Hondros G, Kapsokefalou M, Scott JA. 2008 Sep. Differentiating between the effect of rapid dietary acculturation and the effect of living away from home for the first time, on the diets of Greek students studying in Glasgow. Appetite. 50: 455-63 Crossref, Medline,?Google Scholar. van der Horst K, Brunner TA, Siegrest M. 2011 Feb. Ready-meal consumption: associations with weight status and cooking skills. Public Health Nutr. 14(2): 239-45 Crossref, Medline,?Google Scholar. Slater JJ, Mudryj AN. 2016 Apr. Self-perceived eating habits and food skills of Canadians. J Nutr Educ Behav. 48(7): 486-95.e1 Crossref, Medline,?Google Scholar. Larson NI, Perry CL, Story M, Neumark-Sztainer D. 2006 Dec. Food preparation by young adults is associated with better diet quality. J Am Diet Assoc. 106(12): 2001-7 Crossref, Medline,?Google Scholar. Murray DW, Mahadevan M, Gatto K, O’Connor K, Fissinger A, Bailey D, et al. 2016 May. Culinary efficacy: an exploratory study of skills, confidence, and healthy cooking competencies among university students. Perspect Public Health. 136(3): 143-51 Crossref, Medline,?Google Scholar. Graham DJ, Pelletier JE, Neumark-Sztainer D, Lust K, Laska MN. 2013 Jun. Perceived social-ecological factors associated with fruit and vegetable purchasing, preparation, and consumption among young adults. J Acad Nutr Diet. 113(10): 1366-74 Crossref, Medline,?Google Scholar. Hartmann C, Dohle S, Siegrist M. 2013 Jan. Importance of cooking skills for balanced food choices. Appetite. 65: 125-31 Crossref, Medline,?Google Scholar. Wilson CK, Matthews JI, Seabrook JA, Dworatzek PDN. 2017 Jan. Self-reported food skills of university students. Appetite. 108: 270-6 Crossref, Medline,?Google Scholar. Garcia AL, Vargas E, Lam PS, Shennan DB, Smith F, Parrett A. 2014 May. Evaluation of a cooking skills programme in parents of young children—a longitudinal study. Public Health Nutr. 17(5): 1013-21 Crossref, Medline,?Google Scholar. Robson SM, Stough CO, Stark LJ. 2016 Jan. The impact of a pilot cooking intervention for parent-child dyads on the consumption of foods prepared away from home. Appetite. 99: 177-84 Crossref, Medline,?Google Scholar. Thomas HMC, Irwin JD. 2011. Cook It Up! A community-based cooking program for at-risk youth: overview of a food literacy intervention. BMC Res Notes. 4: 495 Crossref, Medline,?Google Scholar. Wrieden WL, Anderson AS, Longbottom PJ, Valentine K, Stead M, Caraher M, et al. 2007 Feb. The impact of a community-based food skills intervention on cooking confidence, food preparation methods and dietary choices—an exploratory trial. Public Health Nutr. 10(2): 203-11 Crossref, Medline,?Google Scholar. Hardin-Fanning F, Ricks JM. 2017 Dec. Attitudes, social norms and perceived behavioral control factors influencing participation in a cooking skills program in rural Central Appalachia. Glob Health Promot. 24(4): 43-52 Crossref, Medline,?Google Scholar. Brown LB, Richards R. 2010. Teaching students to cook: an easily incorporated assignment in an academic nutrition course. J Nutr Educ Behav. 42(5): 355-6 Crossref, Medline,?Google Scholar. Clifford D, Anderson J, Auld G, Champ J. 2009. Good grubbin’: impact of a TV cooking show for college students living off campus. J Nutr Educ Behav. 41(3): 194-200 Crossref, Medline,?Google Scholar. Levy J, Auld G. 2004 Aug. Cooking classes outperform cooking demonstrations for college sophomores. J Nutr Educ Behav. 36(4): 197-203 Crossref, Medline,?Google Scholar. Caraher M, Dixon P, Lang T, Carr-Hill R. 1999. The state of cooking in England: the relationship of cooking skills to food choice. Br Food J. 101(8): 590-609 Crossref,?Google Scholar. Slater J. 2013. Is cooking dead? 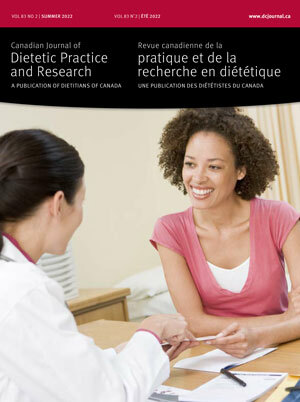 The state of Home Economics Food and Nutrition education in a Canadian province. Int J Consum Stud. 37(1): 617-24 Crossref,?Google Scholar. McMullen J, Ickes M. 2017 Oct. The influence of a campus-based culinary, nutrition education program, “College CHEF,” on college students’ self-efficacy with cooking skills and nutrition behaviors. Building Healthy Academic Communities Journal. 1(2): 61-76 สล็อตออนไลน์888Crossref,?Google Scholar. Courtney SM, Majowicz SE, Dulin JA. 2016. Food safety knowledge of undergraduate students at a Canadian university: results of an online survey. BMC Public Health. 16(1): 1147 Crossref, Medline,?Google Scholar.